Writing regularly, and in this blogging format as opposed to the academic writing I might ordinarily do, will allow me to work through the pedagogical, intellectual, and existential questions I’d like to contemplate during my sabbatical–questions that I’ll explain in subsequent posts. By documenting publicly the ponderings, projects, and pastimes I undertake, I hope to shed light on the academic tradition of the sabbatical and, in a year’s time, have given my readers (and myself) enough evidence to pass judgment on the continued necessity, or even the relevance, of this 135-year old practice (Eells, in “Sabbatical Leave in American Higher Education: Origin, Early History, and Current Practices,” attributes the origin of sabbatical leave in U.S. higher education to Harvard in 1880). For the next year I’ll use #sabbaticaldiaries in the titles of my posts. Rather than a cleansed, curated or carefully composed version of the idea of a sabbatical I want to portray, I’ll try to be as blunt and transparent as possible in conveying what I am doing, what I am thinking, and what my motivations (or lack thereof) are. Let me begin by explaining what I was doing today at my local police department’s property and evidence storage unit. About five years ago I started an event at my children’s elementary school where parent volunteers collect used bikes from the community, refurbish them, and then sell them back to the community at affordable prices. The event, called the Harding ReCycle and held the first Saturday of each May, has grown to the point that this year we sold about 80 bicycles and, after expenses, raised about $3,000 for the school. The local police department has participated in the event each year, sending a couple of bicycle patrol officers to ride around the school yard with kids, teach some basic bike safety, and demonstrate the features of their patrol bikes. Through this relationship we discovered that the department has very limited space in its property and evidence storage unit, most of which is occupied by bicycles. We worked out an arrangement where they call me when they run out of space and I come collect the unclaimed bicycles to be refurbished and sold at the next year’s event. This basically had the effect of transferring the police department’s storage problem to the Harding ReCycle. 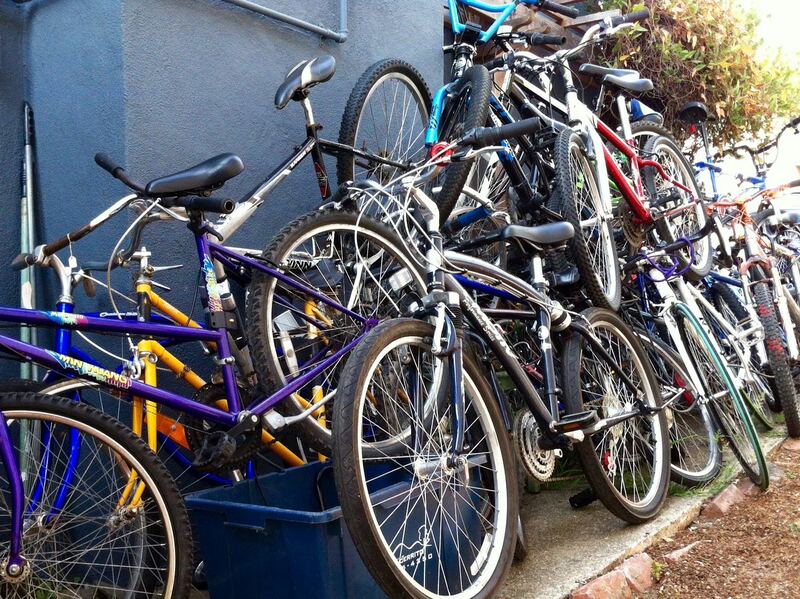 As the picture illustrates, the bikes I collect are currently stacked along the side of my house. There are a couple other families that help out by storing bikes in their yards, but the backyard storage model is not a sustainable solution for a number of reasons. Fist and foremost, the tarp I’ll throw over these bikes before El Niño arrives is woefully inadequate. Consequently, one of the projects I’ll be undertaking during my sabbatical is figuring out a long-term solution to storing these bicycles.